New versions of the ultracool tools pwdump (1.4.2) and fgdump (1.3.4) have been released. Both versions provide some feature upgrades as well as bug fixes. Folks with really old versions of either program should definitely look at upgrading since there are numerous performance improvements and full multithreading capabilities in both packages. If you don’t know..what are pwdump6 and fgdump? pwdump6 is a password hash dumper for Windows 2000 and later systems. It is capable of dumping LanMan and NTLM hashes as well as password hash histories. It is based on pwdump3e, and should be stable on XP SP2 and 2K3. If you have had LSASS crash on you using older tools, this should fix that. 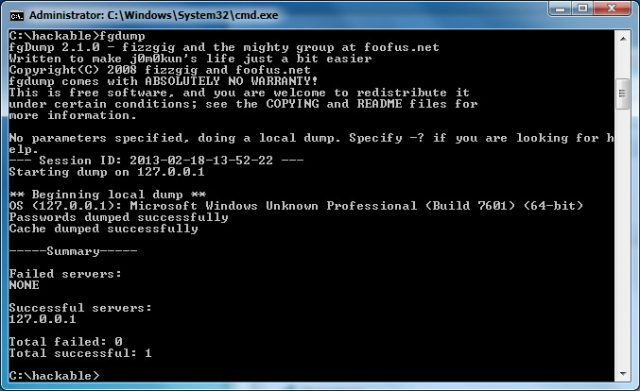 fgdump is a more powerful version of pwdump6. pwdump tends to hang and such when antivirus is present, so fgdump takes care of that by shutting down and later restarting a number of AV programs. It also can dump cached credentials and protected storage items and can be run in a multithreaded fashion very easily. I strongly recommend using fgdump, especially given that fgdump uses pwdump6 under the hood! You’ll get everything pwdump6 gives you and a lot more. Darknet definitely DOES recommend fgdump, super cool update of the old favourite pwdump. So fgdump started as simply a wrapper around things we had to do to make pwdump work effectively. Later, cachedump was added to the mix, as were a couple other variations of AV. Over time it has grown, and continues to grow, to support our assessments and other projects. We are beginning to use it extensively within Windows domains for broad password auditing, and in conjunction with other tools (ownr and pwdumpToMatrix.pl) for discovering implied trust relationships. fgdump is targetted at the security auditing community, and is designed to be used for good, not evil. :) Note that, in order to effectively use fgdump, you’re going to need high-power credentials (Administrator or Domain Administrator, in most cases), thus limiting its usefulness as a hacking tool. However, hopefully some of you other security folks will find this helpful. i lost my admin password for my pc standalone win xp..please i need help to recover my password or clear or reset…if there is a good software or advice on this i would really appreciate .. Cool, but when is there a 64-bit version available? I haven’t been able to extract any hashes from Windows 2003 x64 so far. Is that a safe system or am I just missing the right auditing tools?